So we had no real Father’s Day plans since we don’t celebrate Mother’s Day, why celebrate Fathers Day? We let each other know often enough how much we love and appreciate one another, I get plenty of homemade cards and crafts throughout the year and so does he. We did have plans to go to Greensboro, NC but those plans had fallen through. Saturday was our “Fathers Day” because my husband was set to get his new Atlas stone but nevertheless it will be acquired in a few weeks. On Sunday, it seemed as though we had done nothing with the beautiful weekend we were given so on a whim, as always, we decided to head to Charleston. I was craving some Kimchi Tacos from Taco Boy so we had tacos before the beach. Taco Boy is pretty much across the street from Folly Beach. After lunch, beach time!!! Got the littlest in her suit, the biggest , and the man…. but wait. where is my suit? I left it on the bed… at home, almost two hours back. Well we weren’t going back, and/or breaking the kids hearts and I didn’t feel it was important enough to waste money on so we hiked to the beach anyway in my sweet little blue dress… that now has a broken zipper. Considering that our regular beach is Hunting Island State Park Beach, I hadn’t seen so many people on a beach in a long time. Thankfully it was a cool breeze day because the air elsewhere proved to be hot and sticky, and all we wanted after walking (because parking near Folly Beach is a choir in June) was some cool relief. Not only was the breeze welcomed, but the water temperature was cooler than the “bath water”-title that gets thrown around so often when referring to the southeastern beaches in the summer months. If you have been to any of the low country beaches you know that when the tide is out, you can walk out for a hundred yards with the water skimming past your knees which is perfect for our Little’s because the biggest is clumsy and the littlest is terrified. I did trail out into the water for the fun, I saw it as not a big deal, its water and it will dry and the dress was a sun dress with no real value and besides what is more important than being with your family on a perfect summer day? It’s not sitting on a beach in the hot sun. For some reason I got the idea to go kayaking. I had only really been one other time in my life a couple of years ago with a sister from the church and it was just a girls trip for my bday, we shared the kayak and took it easy+ it was cooler+ we followed the tides. So we headed back toward Beaufort past the first kayak plaza at Folly down to the one at Crosby’s (seafood place), it was a lot less crowded which made me more comfortable inexperience. I sent hubs in to see about the rentals and he comes back to the car saying “let’s go”. What did I just get myself into? 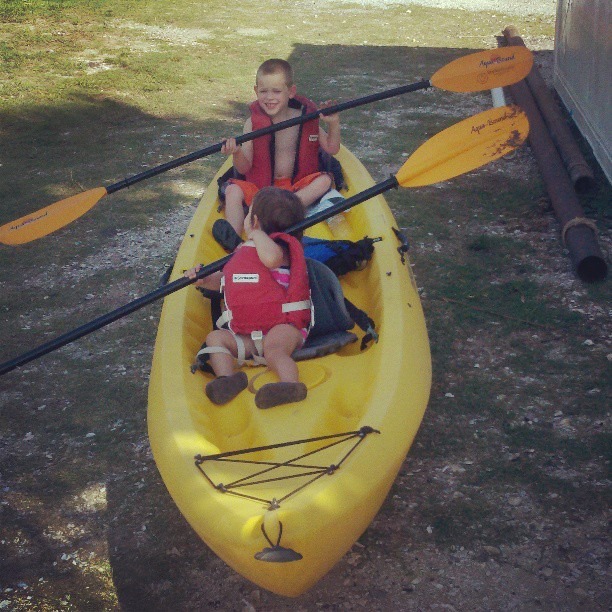 So I am paddling with the littlest (who is 2) and he has the biggest (who is 5). And going out on the water is nice, calm, quiet. We paddle under a bridge to start and the kids are loving this. We paddle down the river around a bend to see a ship wreck. All is fine and well. We go around the ship wrecked ship sticking half out of the water, all tattered and with barnicals all over. And I relize my arms are tired and I have paddled almost none stop for the past hour. so I want to take it easy. We reapply some sun screen, watch the pelican dive near us and I say I want to go back. Well I can’t. My arms are so tired, and to me, we are so far although I can still see the bridge near where we left passed the grassy marsh. I start paddling in the right direction and my right hand is in so much pain. Somehow I got a blister from rowing on the inside on my thumb and it hurt! I develope a new rowing technique and I realize that my hand is stuck in this grasping motion. It cramped up and I couldn’t straighten my hand. I hadn’t realized how much I was working until it was too late. I got caught in a current and turned around THREE times and each time I grew more frustrated and my pain gotworse and I realize I really only have one hand. My husband and his giant muscles are nowhere near, I’m asking for help, asking my daughter not to hang over the edge, and I drop my head. I give up. I completely give up. I may have used profanity at some point, and I said “I can’t do it.” I was almost in tears. The pain of my dumb hand and the frustration of that stupid current were eating me. Then I realized…althought there were two other boats nearby, and I was wearing I could totally hitch a ride back to the dock, hten I realized what a b**** move that was. This was my idea, I am probably not going to die, how dare I act this way infront of our kids. I have totally been hanging out with them too much if I a going to have a tantrum like this. I mean who does that. I said push through the pain a cramping hand with a bleedy blister and salt water can’t be near as bad as that baby I pushed out naturally at 20 years old. I womaned up. I sounded like those dudes who are always grunting at the gym. With each stroke on my right hand I let a loud grunt, or moan sometimes an OWWW. but then I started humming weird songs in my head and got into a basic 8-count dance rhythm, repeating allowed 1,2-3,4, -5,6-7,8 once I got my paddle rhythm back u could stop counting, (my daughter must have thought I had gone stupid, not being able to count past 8, even she counts higher haha) I let my boat mate choose hte song and of course she chose “Row, row, row, your boat”. How appropriate. She climbed in my lap and helped me row after we made it around the bend and away from that other sucking river current. We sang little songs and took it nice and slow. She had so much fun. The boys made it look incredibly easy. My son stayed in his seat. didn’t climb all around like my boat-mate did, and wouldn’t you know he fell asleep on the way back to the dock. hahaha. I would do it again. But now I know its not a race and to not exhaust myself on the way out. Save the energy on the way in. Especially if you r are going against tide and have random creeks and rivers tugging with strange currents. wow that was long. you can tell I am missing my girlfriends this week. How was your Fathers Day? Did you make a post? If, so leave a link in the comment so I can check it out.